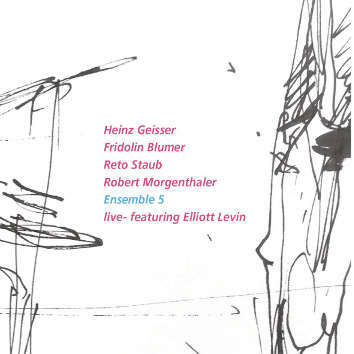 Heinz Geisser – percussion; Fridolin Blumer – bass; Reto Staub – piano; Robert Morgenthaler – trombone; Elliott Levin - tenor sax, flute and poetry. Swiss drummer Heinz Geisser’s four regularly invites a featured artist to its monthly show in Zurich, adding a distinctly different characterisation to each performance. ‘Free bop’ tends to be the expression generally used to describe the group’s music and that suits the music – and me – just fine. Their form of free music exhibits a level of sagacity in its earnestness and this brings on a marriage of vibrant momentum to acutely accurate definition. Each of the two pieces have about 35 minutes and exhibit a range of techniques, from howling to snarling, drubbing to thrashing, fluttering flute and sometimes tremulous traits from an anything but timid tenor. The pieces are richly exciting and full of curiosity.